By compelling reasons, we leave Kazantip ... Maybe just this year, perhaps forever, the Republic of Kazantip in Crimea Popovka leaves and moved to Georgia. We sincerely hope that there will be the Great Kazantip people also happily be lived, how life on our Black Sea coast. Full details of the new living conditions, crossing borders and entering the country Orange happiness are on the official website here. Have a nice housewarming party, my friends! Starting from July 31, 2014 till August 14, 2014, on western coast of Crimea, the 22 th﻿ international electronic music fest - Kazantip - will take place. Kazantip republic is the territory of electronic music of all movements and trends. It is the place where the most talented DJ’s, dancers, musicians, performers and creators gather. Each year Kazantip unites hundreds of thousands people from the whole world. Kazantip republic has settled in Crimea long ago. Tracking its history from legendary rave parties on the abandoned nuclear power plant of Schelkino and dust storms in Veseluy village suburbs, Kazantip finally settled in the country, in POPovka village of Evpatoriya suburbs. The legend started in nineties years of past century, and the first large-scale event happened in 1998 under the slogan “The main project of summer”. Before, Schelkino village was a regular place of festival on the Azov seashore near Kazantip cape. 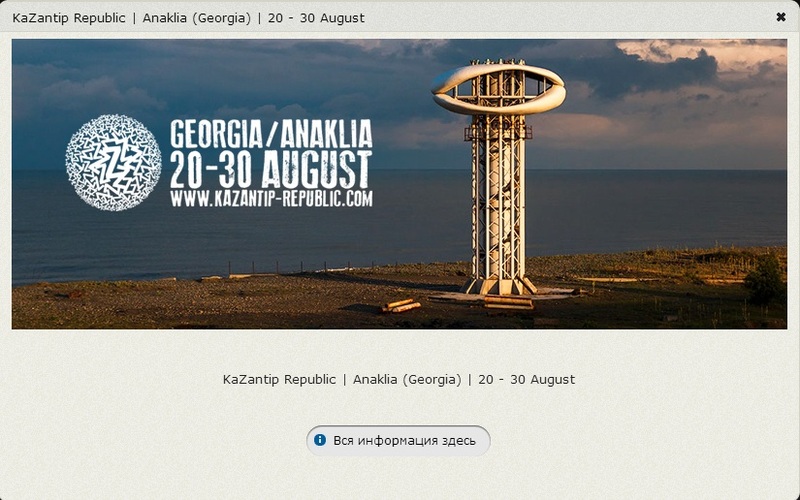 The festival has taken the name after the Kazantip cape. At that time, thousands of young people came to unfinished abandoned nuclear power plant. Three successful atomic projects (of 1995, 1996, 1997 years) allowed Kazantip seriously announcing itself as popular fest for youth, something of a cult. Nowadays, Kazantip is annual open-air fest, taking place on the seashore; the hang around place for advanced youth, for club music fans, for extreme relaxation followers. Festival offers to visitors all trends of electronic music; best DJs of Eastern and Western Europe provide non-stop music and excellent cheerful mood. - The end of June visa cost increased up to 9000 rubles. So, you’ve finally decided to come to Kazantip. Obviously, the question of accommodation will appear for you. The place should be cozy, comfortable and safe, with catering and recreation, including places of relaxation (you will need it on Kazantip, indeed!). In Villa “Kovcheg” Kazantip guests are always welcomed. Villa “Kovcheg” offers placement in comfortable rooms for any period of time. Our hospitable and cordial stuff, wide choice of rooms for any even exacting demand, and complement services will make your staying unforgettable and happy. For example, you can feel safe in the villa thanks to video control system installed there. If you drove your own car, feel free to use parking of Villa “Kovcheg”. Besides, we can offer transfer service. So, please, specify it in the booking form on the site, if you need such service. Our villa works all day and night long and that means that you can completely relax and fall into delight of sun, sea and music. Our accommodation includes only breakfast, but not dinner and supper, so you can choose any dish for your taste in our restaurant for additional price and even order it to your room. Besides, our paid services include laundry and taxi ordering (if you are sated with sun, sea and music) to any place of Europe. Internet access (via WI-FI technology) is provided for free. Villa “Kovcheg” attracts by its cozy green yard with shadowed pergolas , chaise-longs and swimming pool, where you can have rest during sunny day. By the time, our villa stuff will take care of your room cleaning. Bedclothes changing is carried once every three days. All rooms are provided with hot and cold water constantly. You will feel really comfortable on our villa.